Staff from a Shropshire insurance broker are backing a local bid to create a community centre in Wellington. 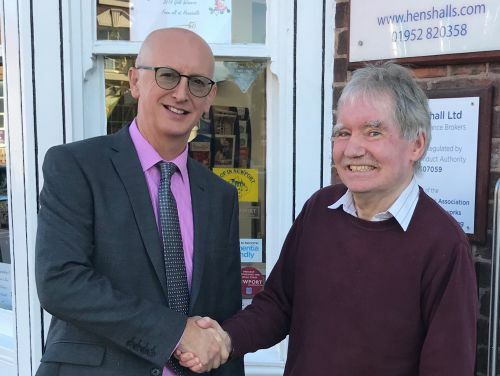 The team from Henshalls Insurance Brokers are supporting Wellington Orbit in their application to the Aviva Community Fund, which gives local groups and organisations from across the UK the chance to pitch for funding. Wellington Town Council will spend its allocation of £150,000 to help bring the former HSBC bank building back into use, and now they’re hoping an application to the Aviva Community Fund will boost their campaign still further. Henshalls director Mark Freeman said: “We are delighted to support the application to the Aviva Community Fund and our aim will be to raise the profile of this fantastic community project as far and wide as we can. Each project that applies to the fund has to generate as many votes as possible from friends, family and supporters in the community in order to make it through to the finals where a judging panel will award the funds. As well as the Telford 50 Legacy fund allocation, the project has attracted – and continues to attract – significant funding from the local community, and supporters hope the Aviva Community Fund judges will choose to support their campaign with another donation. The plan is to refurbish the vacant bank building to include a café and bar area, with a 70-seat cinema on the ground floor, multi-purpose rooms on the upper floors and a basement that will be available to community groups. Henshalls has previously supported an application to the Aviva fund to create a play area next to the children’s ward at the Princess Royal Hospital in Telford.